The Seegarten hotel is located in the elegant Seefeld district in the immediate vicinity of Lake Zürich, only a short walk from the famous Bahnhofstrasse and just a few steps from the Opera House. The terracotta and wooden floors and the hotel's warm colours lend it an appealing Mediterranean touch. 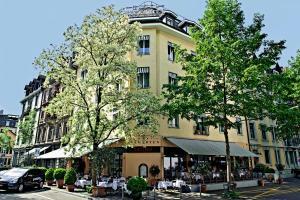 It features an Italian restaurant with a charming terrace. Guests can start their day with homemade muesli and a cup of strong coffee. Latino Restaurant serves freshly made pasta. All sights and attractions are easily reachable on foot. Wireless internet is available free of charge in the entire hotel and there is also a PC in the hallway for the free use of all guests. Public parking spaces and a garage are located in front of the Seegarten hotel.